This guide is dedicated to the variants produced by Kenner where, while producing or because of different factories involved, different colored plastics were used for the same parts of the same character. Most vintage Star Wars figures have i.e. limbs composed out of two colors. The factory now has to choose: Do I mold the arms in “color A” and paint it with “color B” or just the other way around? In most cases the decision was pretty simple. The best solution would always combine economy and quality but sometimes this wasn’t that easy. In general these are called “mold”-variants (like “molded face Luke Jedi” or “molded legs Han Hoth”) but I personally (as a non native English speaking person) always found this very confusing.I don’t know if this is more confusing or not, but in my personal opinion these should be called “mold-color” variants but I am of course open to suggestions. Sometimes it is also hard to determine which one is the “standard version” because they are equally rare, sometimes it is just a difference in production between the Asian factories (Taiwan, China and Macau) and sometimes it is pretty obvious because some of those only were produced for a very short time period. In addition we have figures where the color of the plastic was “left out” for a colored part and sometimes it is additionally sprayed. I will try to determine why, where and who. I hope you enjoy this little guide. The Han Solo figure with small head is the earliest known mold-color variant. To the left you can see a figure with white molded legs and then totally sprayed over with black color. Next to it, a later version with already black molded legs is shown. It never made sense to me that a factory does something that illogical. It is more complex and it is more expensive. Years later I noticed that all figures in the ANH line have something in common: On all characters the legs and arms are molded in the same color, i.e. Greedo has green arms and legs, Luke Farmboy has white molded arms and legs and so on. It could be possible that at least the first 12 figure were similar produced like i.e. Uzay or Polish figures, with arms and limbs together on one sprue tree. That would explain why the early Hans are produced with white molded arms and legs even if the factory then had to completely overspray the whole legs. In my opinion this is the only logical explanation. The production then was changed very fast and Han was build out of black molded legs and white molded arms. 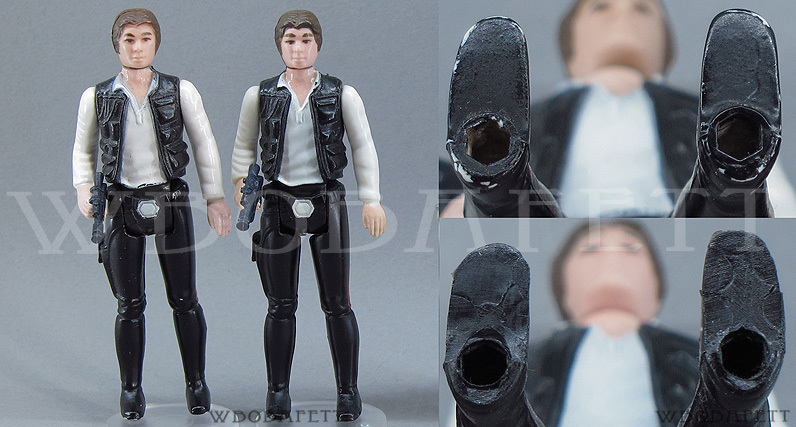 If you want to spot a “white molded legs” Han Solo take a look at the Peg holes and look for tiny rubs to the feet or to the hip. 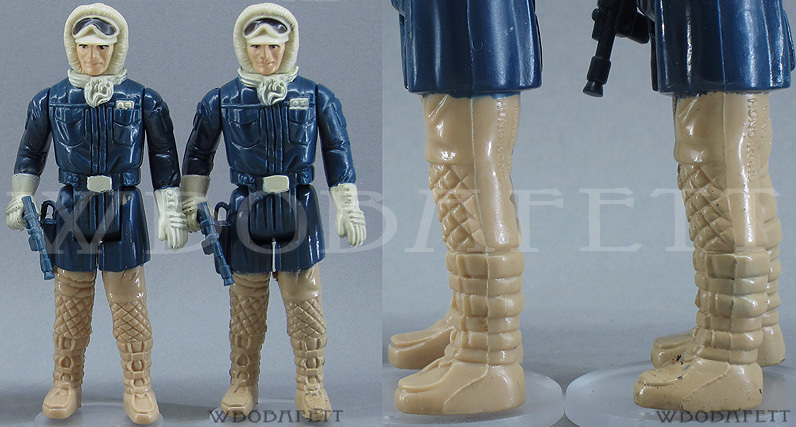 While Han Solo with “white molded legs” is a real oddity the next produced Han Solo (Hoth Disguise) shows the true reasons for mold variants among the Star Wars vintage Kenner figures. To the left you can see a figure with brown molded legs and blue paint applied to the hips whereas the right figure has blue molded legs and brown paint applied to it. Kenner as authority had to answer two questions regarding the quality and the economy. Is it better to risk paint rubs to the feet (playwear) or to the hips (from moving the legs)? The other question was if it is more economic to use the same plastic color for the legs and the arms or make the legs out of a brown plastic and therefore need less color to paint them?? In fact the brown molded legs Han was only produced for a short time period and Kenner went with the solution to the right. Normally such questions are answered in the preproduction stage, but some changes were made later or the communication between factory and authority maybe was sometimes not the best. 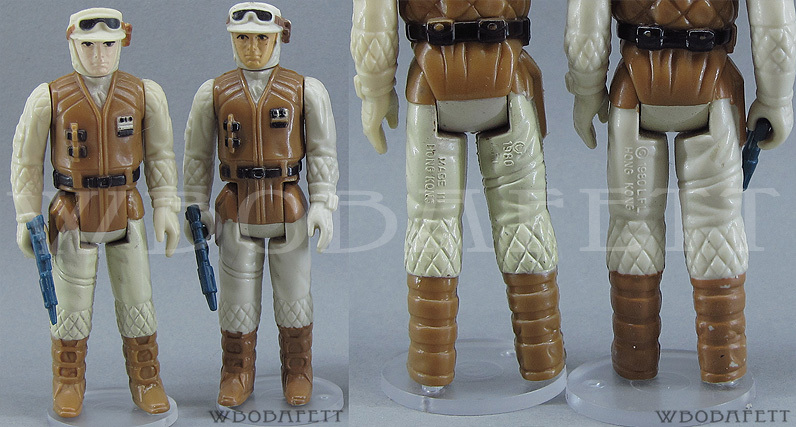 The Rebel Soldier exists, as well as the Han Hoth, with two different produced leg colors. Shown on the left is the figure with brown molded legs and beige painted trousers compared to a figure with beige molded legs and brown painted boots and hips. In this case both figures were probably produced in different factories and therefore both versions exist in larger numbers and are not hard to find at all. In case of the Ree Yees we can be sure these two versions came from different factories. The “Taiwan” produced figures (to the left) have light grey molded legs and flesh colored arms, whereas the “Hong Kong” produced figures (to the right) have dark brown molded arms and legs. The “HK” solution is for sure the more economic one, therefore the “Taiwan” solution is resistant twoards any paint rubs to the hands or toes. To understand how the factories tried to find the best solution in economy and quality I guess Ree Yees is by farest the most interesting figure. Both figure versions are again very common and not hard to find at all. We already saw figures with different molded legs and arms. 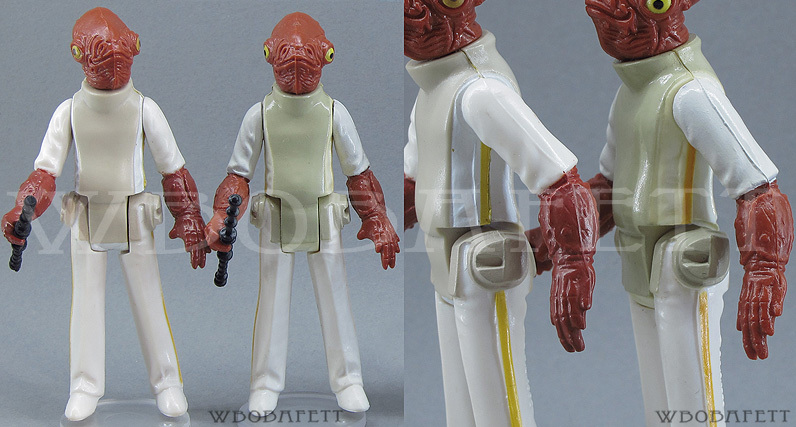 The Admiral Ackbar now has also different molded torsos. The “Hong Kong” produced figures (to the left) have a grey molded torso and white molded arms, whereas the “Taiwan” produced figures (to the right) have a white molded torso and red molded arms. Again “Taiwan” decided to protect the fingers from being rubbed but therefore the torso is often yellowed. In my opinion the best solution would have been a mixture of both: red molded arms and grey molded torso. Again both versions are nearly equally rare and are not really tough to track down. 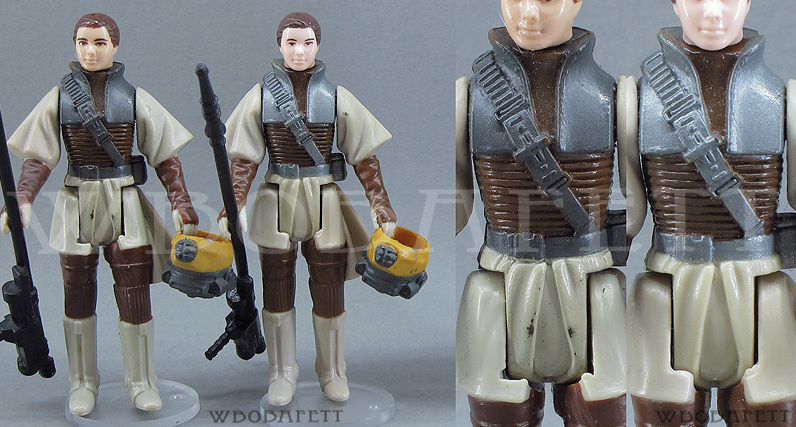 On the Leia Boushh figure a molding variant is present to the torso. Both versions are produced in “Taiwan”. To the left you can see Leia with a dark brown molded torso and to the right you can see the Leia with a beige molded torso. In this case the dark brown molded torso seems to be only produced for a short time period. It is quite harder to find then its beige molded twin. You can also see that the spray masks for the facial details differ quite heavy. If there are no paint rubs to the torso, this is surely the best way to spot those. We now have seen mold variants to the limbs and the torso but of course there is also some figures existing with different molded heads. As you can see the Klaatu to the left has a green molded head with silver paint applied to it. The Klaatu to the right has a silver molded head with green paint applied to it. The green molded head (to the left) is also known as “tan limbs” version. 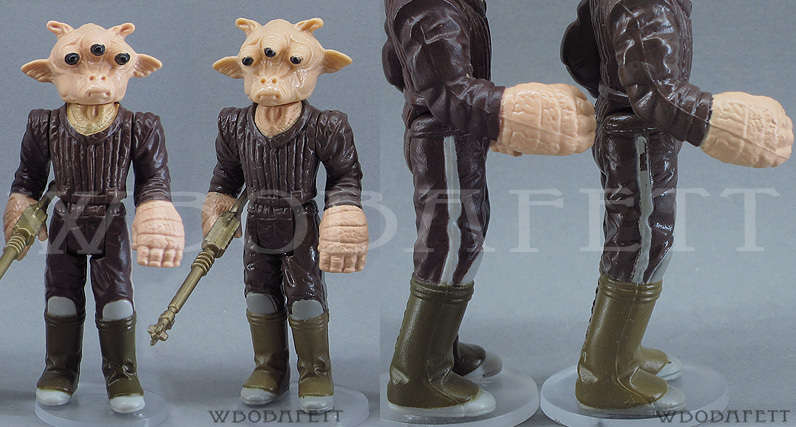 The widely spread opinion that the tan limbs Klaatu is just a discoloured figure is wrong in my own opinion. The figures with “tan limbs” always have a green molded head whereas the silver molded heads always have grey limbs. It is known that mixed up figures with grey and tan limbs present exist, but these must have occurred when the production was changed from green to silver molded heads. While changing the production not only the head color but also the limb color was changed. No matter if you believe in the “tan limbs” version as a legit variant or a discoloured one, the green molded head alone is worth having one. Because of the missing paint layer the details in the face are much clearer and therefore I would always prefer that variant among all other produced Klaatus. Next up is Luke Jedi with flesh molded face and painted hair (to the left) and brown molded head and painted face. Again both versions can originate from “Taiwan”, but I accidentally compared it to a HK figure (to the right) and I accidentally pictured the molded face with a blue lightsaber. 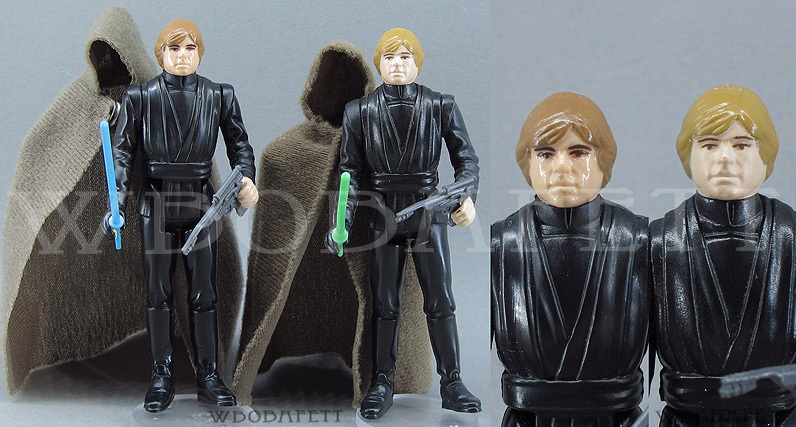 The flesh molded Taiwan Luke Jedi is a sought after figure. I once bought a flesh molded face Luke Jedi with HK Coo in a bigger figure lot. After years I was told these always have to be “Taiwan” marked and I was very surprised mine being different. Till today I have only seen one further “HK” Luke Jedi with flesh molded face. I know that these can be easily faked through a head swap but the time I bought this “Coo collecting” wasn’t “invented” yet and nobody had a reason to do so. In my opinion this is a late release made out of overstock, so more a factory error if you will and not a variant. I am pretty sure that these heads only were produced in the Taiwan factory. 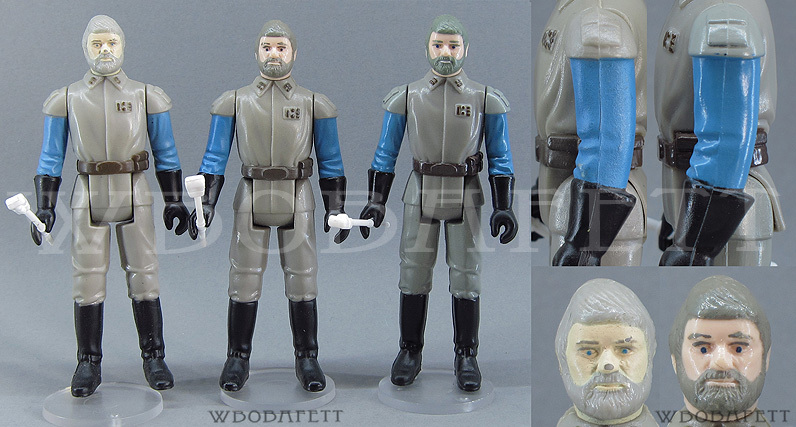 On General Madine we can find three different mold-color variants. The “Hong Kong” produced figures can come with a grey molded head (left) or a flesh molded head (middle). Both head variants can only be found on the “HK on boot” coo variant. In this case the figure in the middle is a “no Coo” (so called Macau) variant. All “Hong Kong” figures have grey molded arms and legs whereas the “Taiwan” produced figures (right) all came with black molded arms and legs and flesh molded face. – “HK on boot” figures can come with flesh or grey molded head and with grey molded arms and legs. – “HK on leg” and “no Coo” figures come with flesh molded head and grey molded arms and legs. – “TW” figures come with flesh molded head and black molded arms and legs. As already stated the “Taiwan factory” again has chosen the option of hands and feet being resistant to paint rubs. 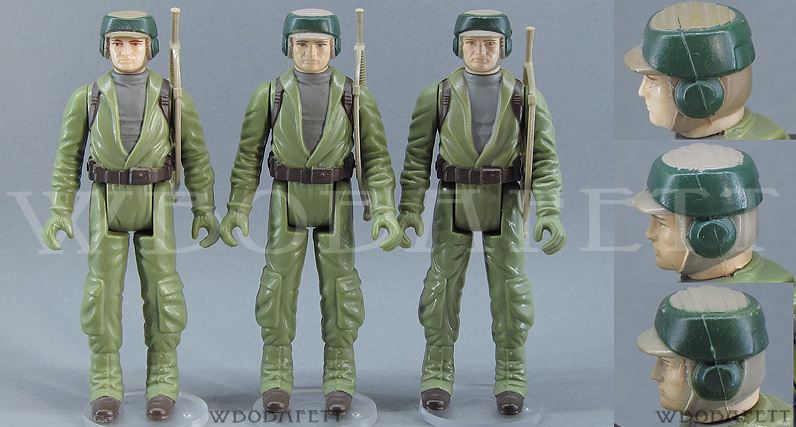 The Rebel Commando now has actually three different mold/paint variants. The figure to the left has a flesh molded head whereas the two figures next to it have a grey molded head. The two figures with the grey molded head are slightly different. Both figures have the peaked part of the cap “left” in grey from the grey colored plastic, but the top part of the helmet is treated different. The figure in the middle has it sprayed grey whereas the figure to the right has the part left without an additional paint application. This is now a new phenomenon to the mold-color variants. The explanation could be simple. The figure with the flesh molded face (left) and the figure with the grey molded head and grey painted top (middle) are both marked “China” figures, so they originate probably from the same factory. If the production was changed (from left to middle) the spraymask probably wasn’t changed because it would have been too expensive and therefore the whole upper part of the helmet was first sprayed in green and afterwards the top part was sprayed in grey (using the same masks like on the flesh molded head). This explanation of course only works if the flesh molded head was produced before the grey molded head in the “China” factory, which is only a conclusion of mine. The Gamorrean Guard is not a typical mold-color variant, but like the Boba Fett I like to add him to this section. We already saw regarding the Rebel Commando that sometimes spray masks are made different (more simple) and therefore colors are applied that wouldn’t have to be applied if the spray mask would have been modified. The Gamorrean Guard to the left has his eyes sprayed yellow and the pupils are just left out. The figure to the right has also yellow sprayed eyes, but additionally green sprayed pupils. 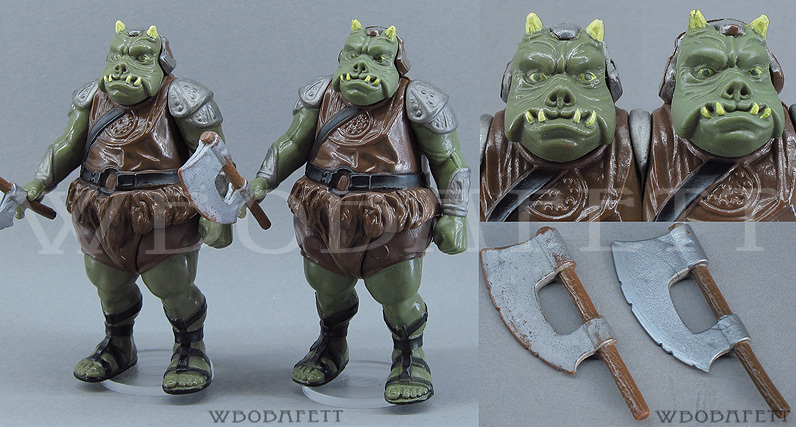 This is an extra step in production and therefore the result should be more complex and expensive but it seems all “Hong Kong” marked Gamorrean Guards are made this way. In addition a very small amount of axes are made out of brown plastic sprayed silver whereas most of those are made out of silver plastics and painted brown. These axes must be very early releases and were only made for a very short time period. You have to be aware because there is very good fakes of the brown molded ones floating around these days. The Boba Fett is last on the list and is for sure interesting but not really belonging here. 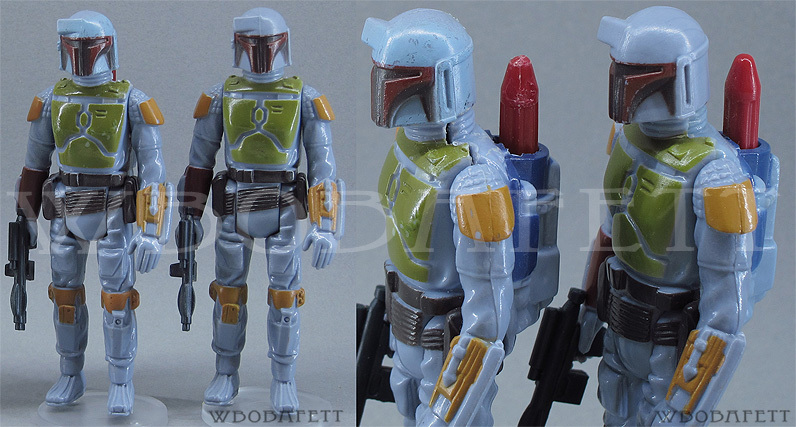 Both pictured Boba Fett figures are “Taiwan” produced, but the figure to the left has its helmet additionally sprayed blue, before the brown and the red color was applied. Now what happened here? I think the solution can be only guessed. In my opinion there are two possibilities. First would be that the “Taiwan” factory had problems with the color (brown and red) bleeding into the blue plastic of the helmet. Therefore they needed an additional layer to prevent the colors from bleeding into the plastic. The other explanation would be that these are from a batch of factory errors were i.e. a wrong color was applied and with the blue paint on it you could start over new. Both of these explanations don’t really make sense regarding the extra costs and the fact that the same red and brown colors are also applied to the arms and legs (same material as the head). The fact that the additional blue color is always only applied to the front of the helmet is at least a hint that it must be because of the visor, for whatever reason. I hope you liked this very little guide and I hope to make more guides soon on “trivial” Kenner produced variants. Thank you Steve. Much appreciated my friend! Great research, Wolff. And well explained too. Thank you very much for sharing this with other collectors. Thank you Marco. Glad you liked it! Hi Wolff, I thought moulded head (painted hair) Luke Jedi never came with a blue saber? And what is the COO of the Rebel Commando on the right? my bad on the Luke. That happens when you make such guides within one day! Sorry. The Rebel Commando can have HK or No Coo. The other two (left, middle) are China marked. I love this guide, you are a true legend of the hobby. Thanks for your research and effort into making this guide. I wonder though if you have any info on the coo correct for the ESB toltoys vinyl cape jawa, I’ve seen two different coo,s and wad erred what you thought and of you owned one? actually it is two COOs on AU VC Jawa! Pingback: Taiwan COO Painted Head Variant Fett? Got here from the TIG forum. Fantastic research here, mega-amazing research, work & effort on TIG! Hi,I am undergoing c section in June 2015 and the delivery dates are from 15th June to 21st June. I am looking for a good date with good time. No worries Clarence I hope you enjoy your trip. 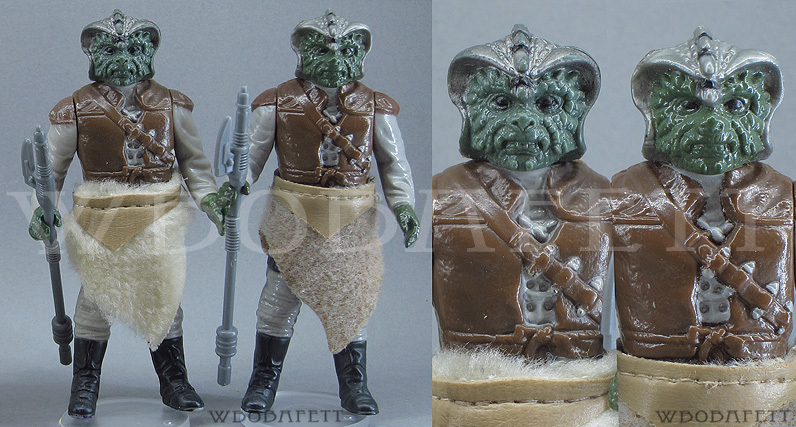 Since your words are diamonds for all of us, iin the case of the rebel commander, it would have been good to mention other differences between the variants , the molded face as far as know has darker brown backpack than the gray molded face. Also I have a gray molded face with its head having the same paint application than the molded including the back of the helmet. However , it has a painted face. I guess this supports the notion of the production runs changes.